Last Thursday, the Trump administration came to the rescue of pro-life nurses and doctors who accuse hospital employers of pressuring them to perform abortions against their religion. A new Conscience and Religious Freedom office within the Department of Health and Human Services will hear complaints from anti-abortion medical personnel who claim they're getting fired or retaliated against for their beliefs. Abortion rights groups are protesting that this Trump administration initiative amounts to a frontal assault on a woman's right to choose. Abortion rights advocates say doctors and nurses who don't want to perform abortions should go into another line of work. That's ridiculous. President Trump's initiative is intended to stop what Cardinal Timothy Dolan calls the "increasing and fierce attack on conscience rights" in medicine. This is not about access to abortion. In New York, for example, abortions are fully accessible. Yet activists want to banish anti-abortion doctors and nurses from their life's work just to ensure a woman never has to hear the words, "I don't do abortions." Pro-life isn't a fringe position. It's nearly half the nation, according to Gallup and Marist polls. In a nation split down the middle, it's inevitable that one person's rights will bump up against another person's. A pregnant woman's choice versus a nurse's conscience. Both have to be respected. Most ob-gyn physicians who identify themselves as Christian don't perform abortions, according to an American College of Obstetrics and Gynecology survey. Most medical students choose not to be instructed in abortion techniques, reports the Hastings Center, a bioethics research group. Ever since Roe v. Wade barred the government from impeding abortion, Congress has repeatedly enacted conscience guarantees for anti-abortion health care workers. Those protections are even in the Affordable Care Act. But when nurses and doctors brought complaints to the Obama administration that their rights were being abused at hospitals and nursing schools, they were ignored. Trump is listening. That's no surprise. He won a majority of church-going voters, a majority of Catholics and a staggering 81 percent of evangelicals. Never mind the scuttlebutt about his private life; he's got their backs. Trump's Department of Health and Human Services has already received 34 complaints from medical professionals about blowback at work because of their pro-life convictions. Republican lawmakers are also responding. Attached to the omnibus spending bill the House and Senate will soon debate is the Conscience Protection Act, giving doctors and nurses the legal right to sue a hospital for conscience violations. 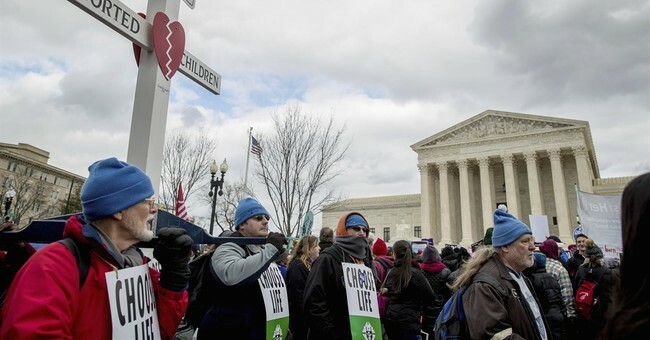 The U.S. Conference of Catholic Bishops is pushing this legislation, claiming anti-abortion advocates in New York, Washington, Oregon and other states are facing discrimination for refusing to provide abortions. A sizable majority of Americans, including many with pro-choice views like mine, oppose forcing doctors and nurses to violate their consciences, according to a Marist poll. Yet the Democratic National Committee is blasting Trump's latest initiative as a "license to discriminate" against women and "rip away access to medical care." Lies and fear-mongering. Consider the Washington state pharmacist accused of discrimination for refusing to sell an emergency abortion-inducing drug. Yet more than 30 pharmacies within a five-mile radius sell it. "This isn't about access," his lawyer said. It's to "ensure that no one would ever encounter a health care professional who disagrees" with their pro-abortion views. That's a dangerously un-American goal. Doctors and nurses have a right to practice medicine according to their conscience. The First Amendment guarantees it. President Trump's new policy protects it.